AKI induces cell senescence in kidney tubular cells. 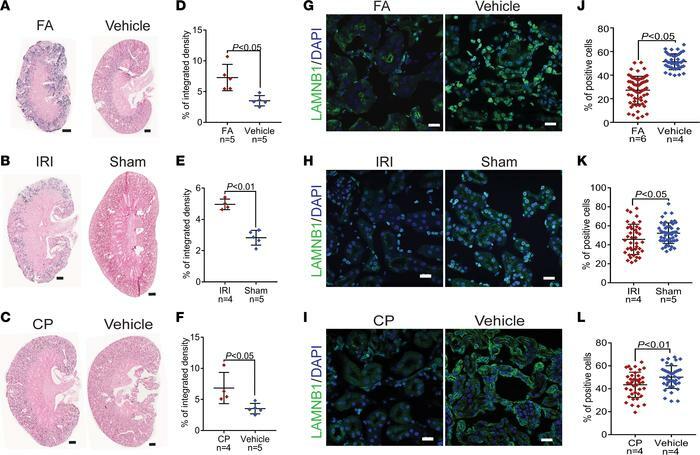 (A–C) SA-β-Gal staining of kidneys in 3 mouse models of AKI (FA, IRI, and CP) 28 days after injury, compared with controls and relative quantification (D–F). Scale bars: 500 μm. (G–I) Representative immunofluorescence confocal images of LAMNB1 28 days after FA, IRI, and CP, and relative digital image analysis qualification of LAMNB1-positive cells (J–L). Scale bars: 20 μm. Data are presented as mean ± SD. P values were calculated with 2-tailed Student’s t test. Ten images per mouse. The numbers of experimental mice are indicated in each panel.